The National Excellence in Geospatial Education Awards have been created to recognize Excellence in Geospatial Education or support for Geospatial Education focused on two-year College programs. The National Geospatial Technology Center of Excellence created the Awards to recognize those individuals and organizations that have supported geospatial education at two-year community colleges. There are three Award categories listed below with the qualifications for each award. 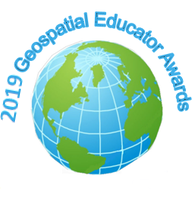 Please help the GeoTech Center recognize these worthy individual or partners by nominating educators or organizations that you feel have made a significant contribution to geospatial education. Your nominations are due by February 1, 2019. Recognition of an educator for their long term contribution to geospatial education at two-year colleges. Contributions include (but not limited to) exemplary teaching, innovation in teaching, student mentoring and support, building workforce and education partnerships, community outreach, providing leadership and other activities over a career at a two-year college. Qualified Candidates for Lifetime Achievement Award: A geospatial educator from a two- year community college including current or retired full or part-time (adjunct) faculty. Recognition of an educator who has made significant contributions to geospatial education in the last two years. Contributions can include innovations in teaching, curriculum and program development, creation of articulation agreements, student mentoring and support, and leadership or other activities that can be applied to other geospatial programs nationally. Qualified Candidates for Distinguished Educator Award: An educator (full or part time) at a high schools, two or four year college or university that works closely with educators at all education levels in support of geospatial education. Recognition of an organization that has made significant contributions in support of geospatial education at two-year community colleges. The contributions can include outreach, curriculum development, internships and student support, resources for teaching and program development. Qualified Candidates for Distinguished Geospatial Education Partner Award: An organization (industry, professional organization or government agency) that has worked closely with educators, students or geospatial programs at two-year community colleges. Nominations are due by February 1, 2019. Any individual (over 18 years of age) may make one nomination for each of the Award Categories per year. Self-nominations are allowed but must include a letter supporting the nomination by another qualified individual. If you have any question about making a Nomination, please contact Ann Johnson. Name, organization, mailing address, email address and phone number of individual making the nomination. The name and contact information (organization, address, email address and phone) for the person being nominated. The Award Category for the nomination. A short description of why the nomination should receive the award (minimum 100 to maximum 250 words). If a self-nomination, a letter of support from another person including their contact information.